Darren Bent’s fourth goal in five games earned a point for Derby and knocked promotion rivals Bournemouth off the top of the Championship. Matt Ritchie swept in a stylish opener for Bournemouth after Yann Kermorgant played the ball into his path. But Bent set up forward Tom Ince to equalise on the half-hour mark. Callum Wilson fired in to give Bournemouth a half-time lead, before Bent – on loan from Aston Villa – scored from a Simon Dawkins cut-back. Bournemouth showed why they are the country’s top scorers by taking the lead with their first meaningful chance. Wilson went bursting down the right and his cross was chested down by Kermorgant for Ritchie to send a cushioned volley beyond Lee Grant and into the bottom right corner. It was a blow for Derby, who then lost top scorer Chris Martin to an injury, and could have gone further behind as Wilson seized on a poor header from Richard Keogh and steered his shot wide from the edge of the penalty area. Home goalkeeper Artur Boruc made a terrific save to stop a near-post volley from Bent – on for the injured Martin. But Derby hit back as Ince finished emphatically from 12 yards after the busy Bent had robbed Bournemouth defender Steve Cook by the corner flag and pulled back a cross. Wilson restored Bournemouth’s advantage in the final minute of the half, ripping a right-foot shot across Grant into the top corner after Kermorgant had worked tirelessly to chase a long punt up field and keep the ball in play. The second half was not as frenetic as the first but it required an excellent block by Bournemouth captain Tommy Elphick to deny Ince a second after the winger wriggled past two defenders. Bent silenced the home fans in the 67th minute to earn a point – again showing Aston Villa boss Paul Lambert what he is missing by sending him on loan. Yorkshire sealed a quarter-final place in the One-Day Cup with a 10-wicket win over Derbyshire at Scarborough. 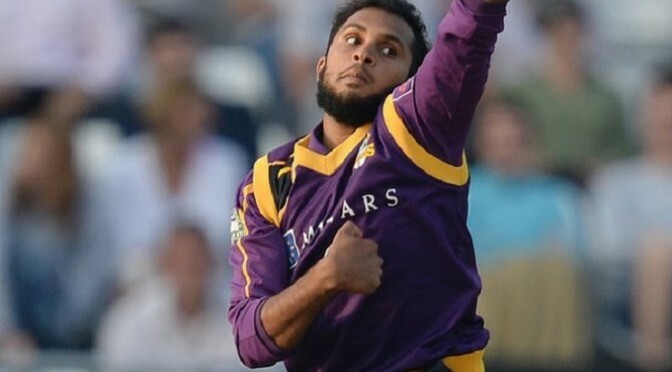 The visitors were all out for just 151, with Rich Pyrah (3-25) and Adil Rashid (3-45) the most successful bowlers. Yorkshire openers Adam Lyth (67) and Alex Lees (69) knocked off the runs in 29.3 overs either side of lunch. Derbyshire’s cause was not helped by paceman Mark Footitt being ordered out of the attack for bowling a beamer and three bouncers in the same over. Umpires Peter Hartley and Mark Benson took action against the left-armer, who signed a new contract with the county earlier this week, in the ninth over and Marcus North had to complete it by bowling the final delivery. Earlier, England’s Tim Bresnan (2-30) removed Wes Durston and North in his first two overs with the new ball and after reaching 73-3, Derbyshire then lost Billy Godleman (36), caught at point by Lyth, and Scott Elstone to successive deliveries from Pyrah. Only Alex Hughes offered much resistance thereafter, making 43 off 76 balls before holing out at deep mid-wicket off Steve Patterson (2-27), who brought the innings to an end with the final ball of the 41st over as he yorked last man Footitt. Facing such a low target, Lyth and Lees were able to play pressure-free cricket as they took the score to 64-0 at the interval. Lyth was quickest to fifty, taking 63 deliveries as opposed to 66 for his partner, and hit a six and eight fours during his innings, but it was Lees who ended the game with a four off Ben Cotton, the 10th of his innings. Yorkshire’s victory was their fifth from seven games played so far and ensured they will be in the last eight irrespective of the result from their final group fixture away at Hampshire on 21 August.